Nina Suraya Sulaiman (left, bottom right) says her maid deserved the punishment meted out for abuse. 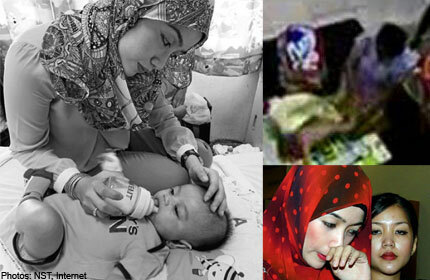 KUANTAN, Malaysia - Tears streaming down the face, bank clerk Nina Suraya Sulaiman could not hide her relief after the Sessions Court here sentenced her Indonesian maid to 20 years' jail for abusing her 4-month-old baby. "She deserves the severe punishment for what she had done to my son," said Nina in between sobs after sentence was passed. Yuliana, 24, from Aceh, pleaded guilty to attempted murder and physical abuse of Mohamed Hareez Mohamed Zamri. She committed the offences at the victim's home at Lorong Bukit Setongkol, here, at 7.45am on Feb 15. Judge Mohd Azhar Othman sentenced her to 15 years' imprisonment for the first offence and another five years for the second offence. Azhar, however, ordered the jail terms to run concurrently from the date of arrest. He said the deterrent sentence would serve not only as a lesson to the accused but also the public. "Children should always be given loving care because they carry the hopes of the next generation," he said, adding that Yuliana's act would also affect people's trust in their maids. Clad in a purple lock-up uniform, the accused, who was unrepresented, cried uncontrollably when the sentence was delivered. When asked by the court interpreter if she had anything to say in mitigation, Yuliana paused for several minutes before saying: "Saya takut (I'm afraid)". Deputy public prosecutor Nor Azizah Mohamad, however, pressed for a deterrent sentence as she claimed that Yuliana's act was serious and had been highlighted by the media. Nina later told reporters that Hareez's condition had improved after he was discharged from Tengku Ampuan Afzan Hospital on Monday.